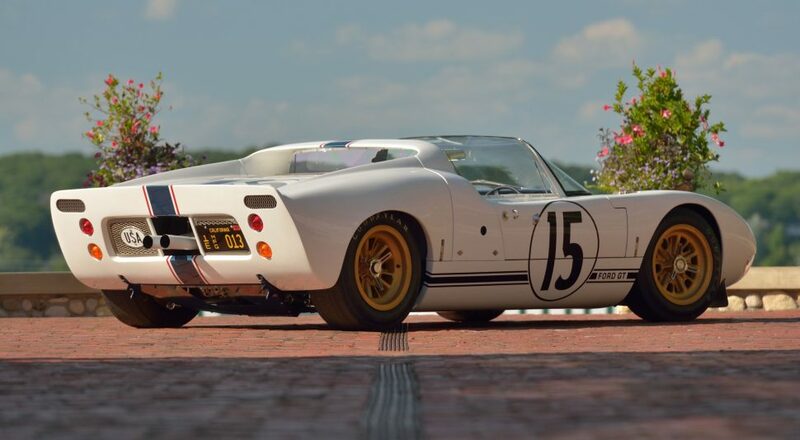 1965 Ford GT40 roadster. Photos by David Newhardt, courtesy Mecum Auctions. After disappointing performances in 1964 and 1965, Ford’s GT40 coupes dominated the 24 Hours of Le Mans from 1966-’69. The automaker experimented with GT40 roadsters, too, building five prototypes for endurance racing before abandoning the project. Four of these open-top variants raced at various venues worldwide, but only one, chassis GT/109, ever competed at Le Mans. 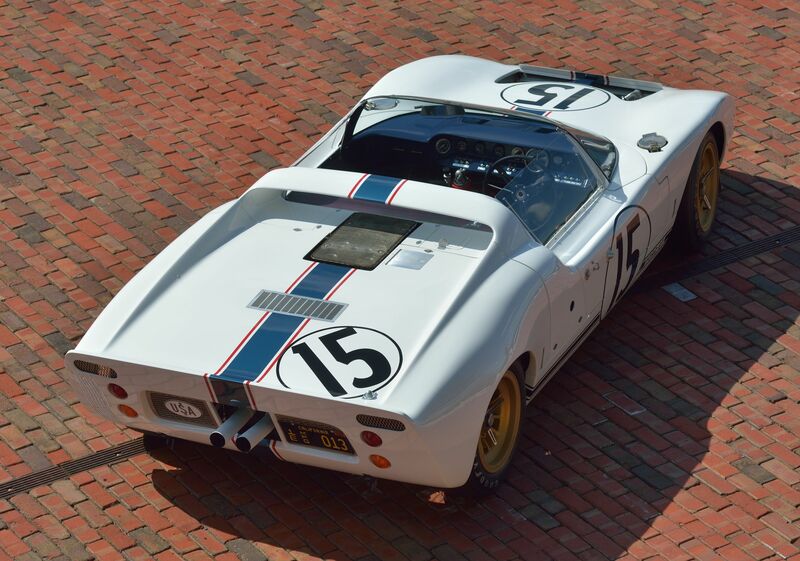 On January 12, 2019, this 1965 Ford GT roadster will cross the block in Florida, very likely the star attraction at Mecum’s 2019 Kissimmee sale. Chassis GT/109 was one of four roadsters constructed with steel frames, while one – chassis GT/110, nicknamed “Big Ed” – was built with an aluminum chassis and supplied to McLaren for FIA Group 7 racing. The GT40 roadsters were intended to be lighter than their roofed brethren, but the open-air design presented drawbacks along with weight savings. 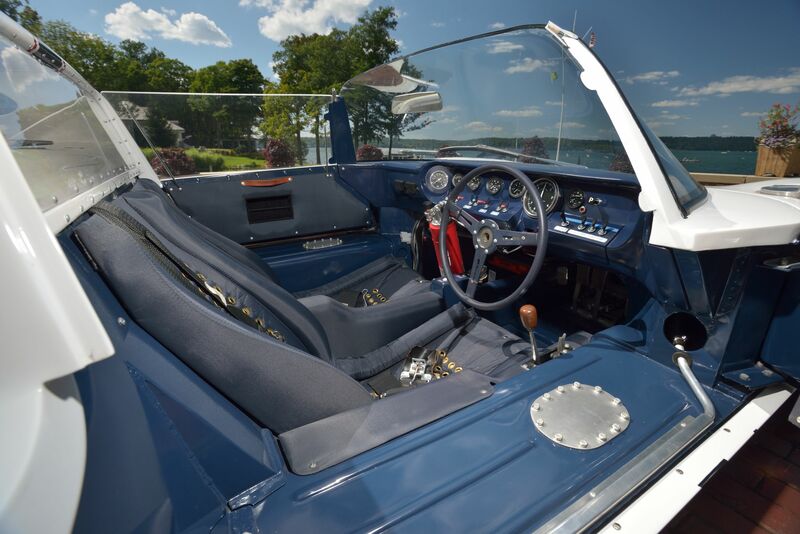 Aerodynamic drag was an issue, and while Ford experimented with different windshield shapes and heights for the GT40 roadsters, it remained problematic throughout the car’s development. Chassis flex impeded handling, and even before the first GT40 coupe victory at Le Mans, the GT40 roadster program had essentially been abandoned. As reported by World Registry of Cobras & GT40s, 4th Edition, chassis GT/109 was received by Ford Advance Vehicles (FAV) in October of 1964. An internal document refers to the car as “Dearborn Experimental Car With 3” longer chassis – Now Not Required,” though it isn’t clear what the purpose of this heavier and longer platform might have been. 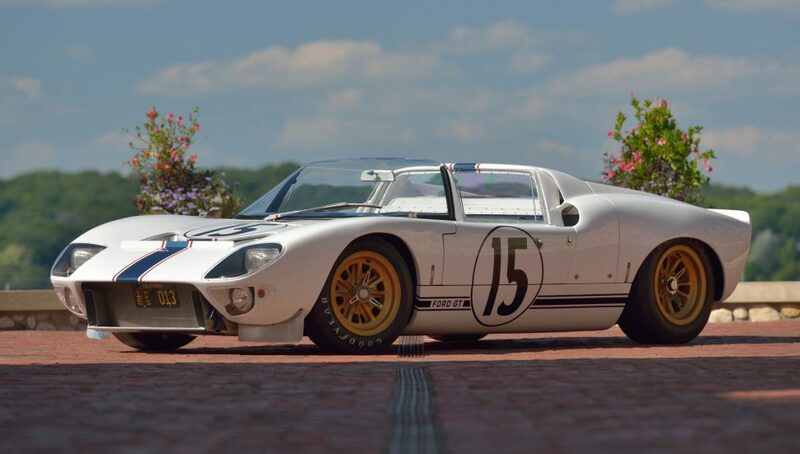 In March 1965, the car was shipped from FAV to Shelby American, where it was prepared to compete in the 1965 24 Hours of Le Mans as a Ford France entry. Part of this work included painting a dark blue center stripe with a red border, the colors of Ford France. Once GT/109 arrived at the Circuit de la Sarthe, the number in the white meatball was changed from 9 to 15, and testing was carried out by drivers Andre Simon and Jo Schlesser. For the race, the car would be piloted by French drivers Maurice Trintignant and Guy Ligier. Ligier never had a chance to climb behind the wheel. Just 11 laps in, and less than two hours into the race, the gearbox let go, and Trintignant limped the GT40 back to the pits. When a GT40 coupe entered by Scuderia Filipinetti and Shelby American (car number 6, driven by Herbert Müller and Ronnie Bucknum) lost its righthand door mid-race, chassis GT/109 donated the part. It was hardly an exact fit, but the roadster’s door plugged a significant portion of the hole. This GT40 retired early as well, its day ended on lap 29 with a head gasket failure. Following the 1965 24 Hours of Le Mans, chassis GT/109 was shipped back to Shelby American in California, repaired, then send to Kar Kraft for use in development of the J-Car. Later returned to Shelby, the roadster was stored outside for an extended period – likely several years – before being sent to Ford in Michigan. Just another retired racing car with little monetary value, it was parked in a dusty warehouse with other prototypes and cast-offs, largely forgotten. It was customizer and car builder Dean Jeffries who rediscovered GT/109. As Tom Cotter related in Dean Jeffries – 50 Fabulous Years in Hot Rods, Racing and Film, Jeffries had accompanied friend A.J. Foyt to Ford’s wind tunnel complex near Detroit, to assist with fine tuning the aerodynamics of his latest Indy Car. There, with down time between testing sessions, Jeffries spotted the abandoned GT40 – missing its engine and transmission – in storage and badly in need of restoration. Jeffries asked Ford’s Jacques Passino if the car might be for sale and was told instead, “No, don’t worry about it, just take it. It’s no good anyway. And take whatever parts you need for it.” Dutifully following Passino’s guidance, Jeffries drove his truck to Kar Kraft to stock up on spare parts that would be required to rebuild GT/109, including a complete Ford 289 V-8 and a pair of transmissions, one from Colotti and one from ZF. Passino wasn’t done cleaning out the warehouse just yet, either, and insisted that Jeffries take a pair of unused four-cam 255-cu.in V-8s, relics of Ford’s Indy Car program that were once considered for use in the GT40. Jeffries didn’t quite know what to do with his haul, and initially envisioned building a street rod from the former race car. Other projects took priority, and years went by, followed by decades. 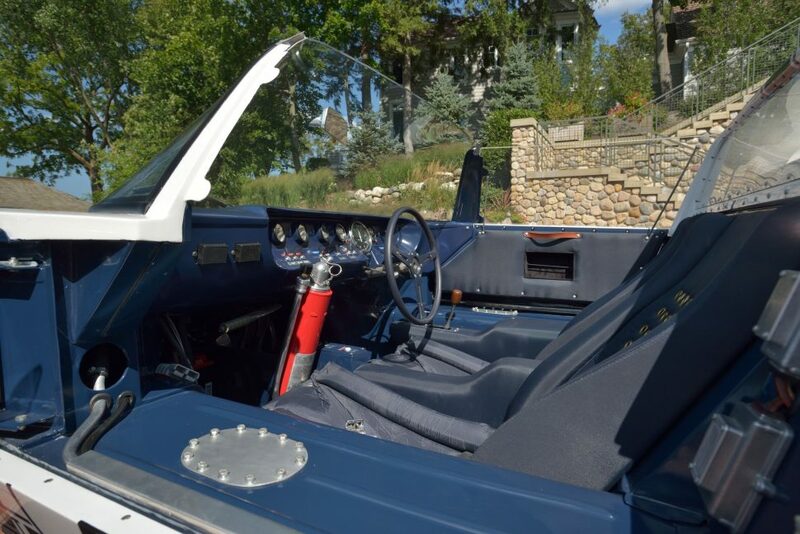 He continued to amass GT40 parts as he found them, knowing that the project would one day be tackled, but by then the value of GT40s made customizing his rare roadster seem unthinkable. 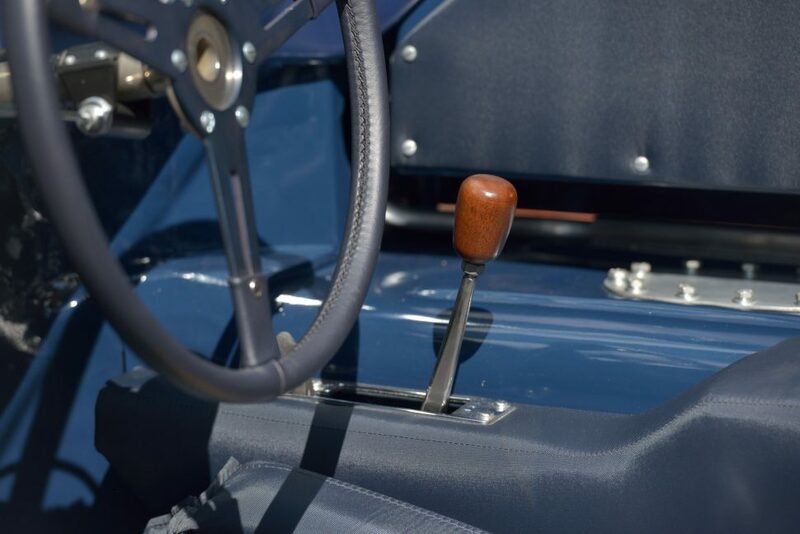 An interested buyer in England once offered him $5 million for the still-unrestored collection of parts, but even then Jeffries refused to sell. Instead, he rebuilt the car – slowly – using the Passino-gifted four-cam 255 V-8 instead of the correct 289. It took until 2003 for the roadster’s restoration to be completed, and, as part of its 100th birthday celebration, Ford “borrowed” the GT40 roadster to display at the Rolex Monterey Motorsports Reunion. Once described as “his favorite toy,” Jeffries owned GT/109 until his death in May 2013, and at some point, the 255 was replaced by the 289 V-8 the car carries today. Under the consigner’s care since 2013, GT/109 was displayed in the Ford GT40 Victory at Le Mans 50th Anniversary class Pebble Beach in 2016. Never before offered in a public sale, it’s difficult to put a value on the car, though its sister car, chassis GT/108, sold at auction in 2014 for $6.93 million with fees. Given this car’s raced-at-Le Mans history, it’s likely to achieve an even higher price in Florida next January. For additional details on the Kissimmee sale, visit Mecum.com.